My sister Christine celebrated (dare I say?) her 50th birthday today. I wish I could be with her to join in the celebration but I'm so glad she has lots of friends. Chris owns a consignment shop in Clearwater, Florida and her customers have all become her friends. I think she takes after our mom. I found some old photos that I had to share with you. This is right after Christine was brought home from the hospital. I was thrilled to have a little sister. My brother Steve had hoped for a brother but I think he was pretty happy with her, after all. 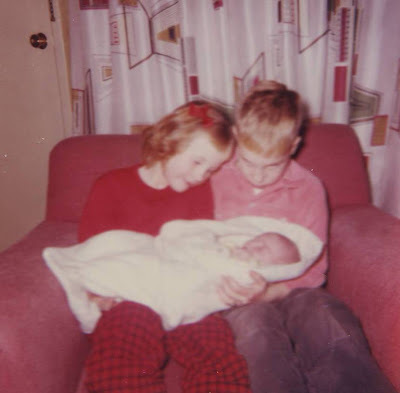 Here my brother Steve is holding Christine who looks like a little doll. 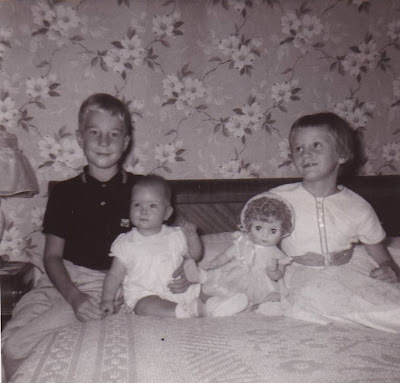 Of course, I had my own doll to hold. 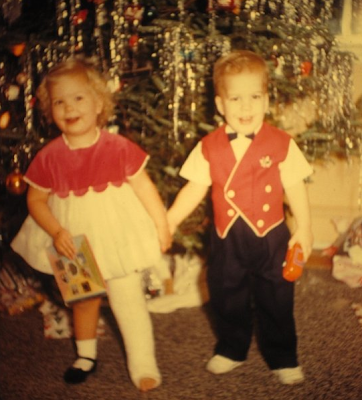 Here she is when she was about two or three years old with our cousin James. She had fallen down the stairs and broke her ankle. That's the truth too. She still had a smile! Here she is all grown up. I think she was in her twenties here. Hmm ...I think that's my dress. We used to borrow each other's clothes. 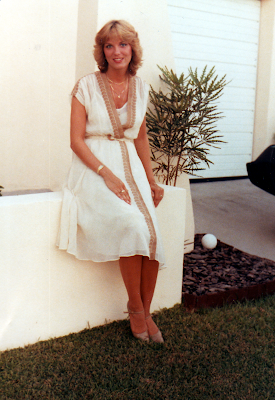 Chris was my maid of honor at Greg and my wedding in November of 1984. Here is Christine with her family. Her husband Pat and her stepsons Zach and Taylor. And she's a dog lover. Ren has since died but she now has Jack. I miss you and wish I could be there with you to give you a hug. What a precious tribute! Having three sisters of my own, I know the special bond that forms. Something tells me she looks up to "big sis" still. What a beautiful pair of sisters! It is such a special bond. My sister is my best friend. I'd give Christine a birthday hug today too, if I could. So, Happy Birthday Christine! You gave her a precious tribute and I am sure she wishes you two were together as well! Love and Blessings to you both! Beautiful birthday post and tribute to your sister! Happy Birthday to dear Christine, such a precious tribute. You are adorable and so is your sister! MY best friend sister (Sonja...you know her) and I reminds me of you and Christine. Loved the way you wrote about her! Happy Birthday to your sister! She looks as sweet as you do. There is just nothing in life for a woman like a sister. Such a special bond. One of life's best blessings for sure. HAPPY BIRTHDAY to Christine! I'm sure she missed you too! Happy birthday to your sis. It is so special that you are so close. Love the last photo of her family with their old dog. Have a blessed week. Aw, Happy Birthday to sis! What sweet pictures. Thanks for your suggestion to see the Brooklyn Tabernacle on our next visit to NY. I can't wait to go back! Happy Birthday to your Sister. :o) You both are absolutely beautiful! how precious! she's pretty like you debbie. happy birthday, chris! Your sister is just as gorgeous as you are! Have a blessed week, my dear friend. Such a sweet post of memories! It's been a while since I've been in blog land. Such a joy to visit tonight. You simply bless me. Happy Birthday to your sister. It is wonderful to have special sisters! God bless you both. Sisters are so special. I love the pics. A Happy Birthday to your sister! Hope that she is doing well and had a wonderful day! I love your photos that you shared. What a cute baby doll...she really did look like a doll next to yours. Oh! one more thing...I love your wedding photo too! Such a nice post for your sister! I like the childhood pictures. I was looking at some this weekend of my childhood. Aww, loved the photos...I'm sure her birthday was as beautiful as she is!! You both are beautiful!! I hope you and your sister received my Christmas card last month. Love you.